Caption: Candies dandy ,but Liquor's quicker. Caption: I resolve not to give men I don't know raging boners. Oops, blew that one already, didn't I? Filename: Rockin' in the new year!! Caption: In a smoking hot, rocking "Little Black Dress!!" 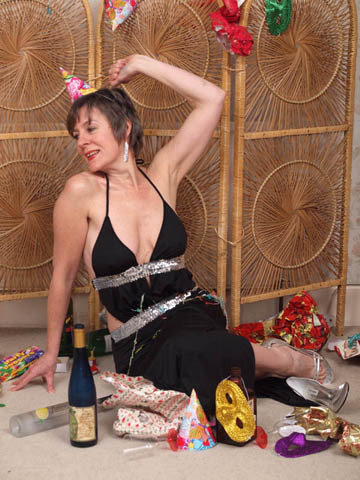 Caption: Too Much to Drink Too much celebration Too much Vicar Too much Clothes Not enough Miss Jones! Caption: New Year same old hangover..........would love to see MJ hanging over tho'....or a certain couple of things anyway. Caption: Another one over the shoulder...that's the way to do it.